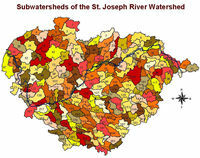 The St. Joseph River Watershed is located in the southwest portion of the Lower Peninsula of Michigan and northwestern portion of Indiana. It spans the Michigan-Indiana border and empties into Lake Michigan at St. Joseph, Michigan. 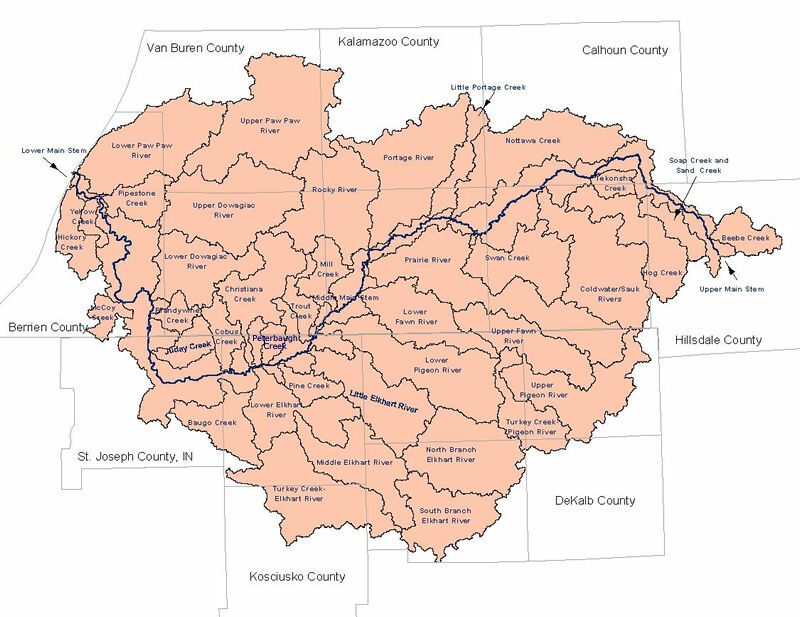 The watershed drains 4,685 square miles from 15 counties (Berrien, Branch, Calhoun, Cass, Hillsdale, Kalamazoo, St. Joseph and Van Buren in Michigan and De Kalb, Elkhart, Kosciusko, Lagrange, Noble, St. Joseph and Steuben in Indiana). 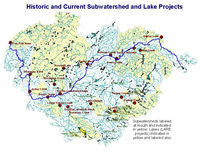 The watershed includes 3,742 river miles and flows through and near the Kalamazoo-Portage, the Elkhart-Goshen, the South Bend and the St. Joseph/Benton Harbor metropolitan areas. According to the 2000 U.S. Census, 1,524,941 people live in the 15 counties of the watershed, with 53.6% living in Michigan. The most populated county is St. Joseph, IN. The watershed is largely agricultural. More than 50% of the riparian habitat is agricultural/urban, while 25-50% remains forested. 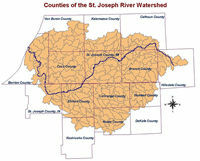 Links to additional watershed information. 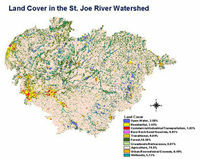 Subwatersheds of the St. Joe River Watershed. 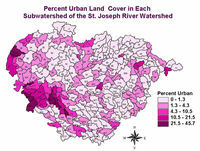 Source: USGS Nat'l Hydrology Dataset. Digital Elevations of the Watershed on a 300 meter resolution and subwatershed delineation. Wetlands in the Watershed. 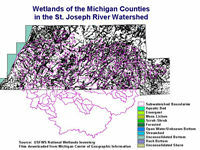 Click on the image to view each Michigan county individually and to view Indiana wetland maps. 1990's Land Use. 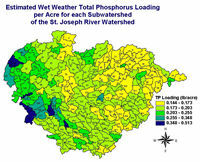 Watershed is over 70% agriculture. Michigan Presettlement Land Cover, circa 1800s. 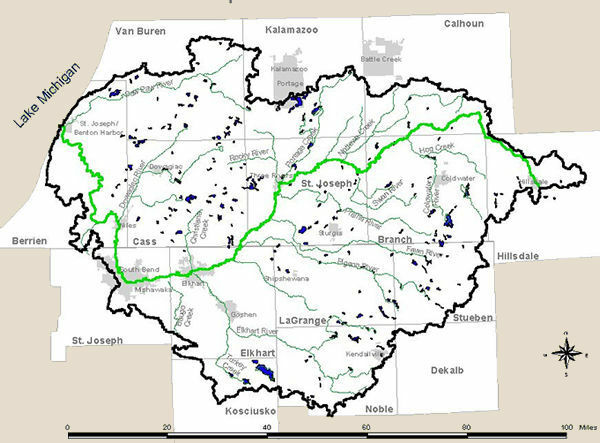 The watershed contains 19 impaired water bodies in Indiana and 14 in Michigan, as defined by the Clean Water Act 303(d). Combined Sewer Overflow Outfalls in the watershed. 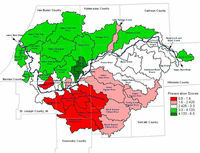 USEPA Enviromapper for Watersheds. Click image to access maps of federally regulated facilities. 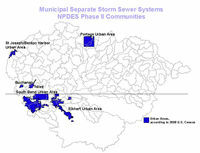 Communities regulated by Phase II of the NPDES Program. Federally regulated facilities in the watershed including NPL, NPDES, RCRA. Total Phosphorus and Total Suspended Solid Nonpoint Source Loading Model. 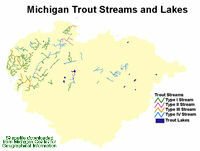 Michigan Designated Trout Streams and Lakes. Link to Indiana Trout Stocking Information. 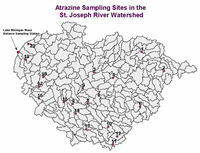 Atrazine issues in the Watershed. United States Geological Survey Water Resources Stations.